Choose who sees completed critiques and when in critique settings. Typically, in online classes, students are working at odd hours and rarely at the same time. This means that on a particular writing assignment, critiques from students can come in early in the week or late. Some instructors prefer that all critiques be available for everyone to read as soon as they are posted. Others may prefer to keep all critiques private ("locked") until after the due date -- so that critiques are written without any influence of other critiques. Open: Students can read critiques as soon as they are posted. 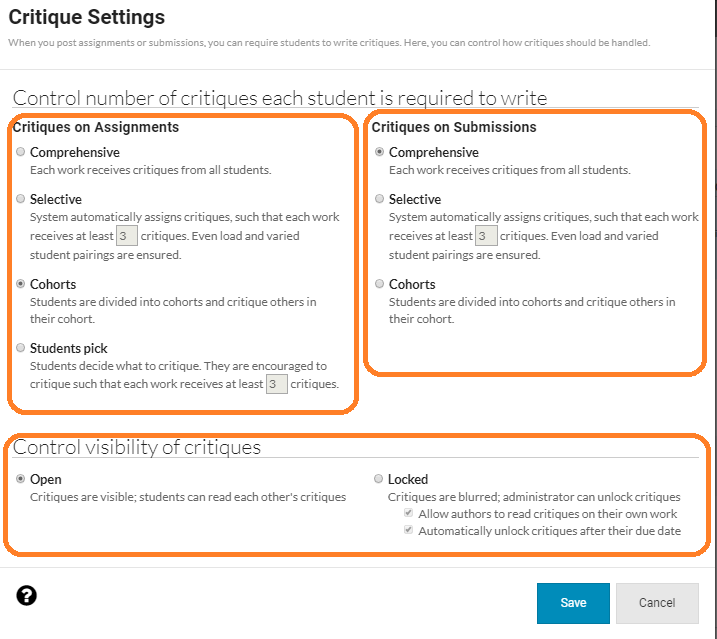 To change your critique settings, go to your "Class Administration" and select "Critiques" from the left navigation. Click the "Critique Settings" button.